Black Carved Lava Coal Morning Pin Brooch Jewelry Victorian Era Bar Criss Cross pin with hook fastener. I think it is coal. Measures 3 inches long X 1/2 inch wide. Czech Beaded Trivet Czechoslovakia Seed Beads Hand Made Victorian Era round Matt Hand Crafted of Seed Beads starting at the center and spiraling outward in a circle. 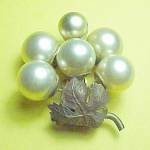 Victorian Dress Clip Grape Leaf Junk Junque Jewelry Elegant Accent, Bunch of Grapes, I think it may be gold plated Brass, Art Nouveau style clip on backside. I am guessing Circa 1890 to 1910 Victorian Era, but am no expert. Gorgeous detail raised veins in the leaf, Big Faux Pearls. Note: the photo is upside down, it is worn with the leaf at top. Measures about 1 3/4 inch wide. Used and Unfortunately, one pearl ball is missing and has been replaced with a too small bead with holes in the sides. Maybe you have just to replacement piece to restore it. The balls have some light scratches mostly on backside, and there is a bit of greenish tarnish to the metal. Most of the gold plate is worn away, but it is still lovely. Great for Craft Crafting Jewelry making also. Tiny, intricate, openwork pin with a Script initials AS or HS (could be for a name or a school or Special Society group). The bow at the base of the letters is engraved 96. I believe it is silver plated. Unmarked. Measures 9/16 inch wide X 2 5/8 inches long. A lovely addition to a vintage jewelry, stickpin or hatpin collection. Victorian Lingerie Pin Victorian Lingerie Pin. Vintage Carved Mother of Pearl Initial B Pin Brooch Vintage Carved Mother of Pearl Initial B Pin Brooch. Pretty carved leaf with twisted goldtone letter B and pin and hook clasp. Measures 3/4 inch X 1 inch. Excellent condition. Victorian Mourning Brooch Clip Earrings Black Glass Gorgeous faceted black crystals set into black enameled swirled settings.